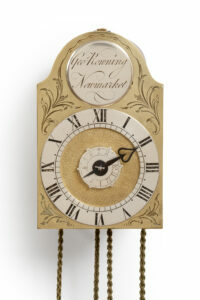 The weight-driven, 12-hour movement of this lantern clock has going, striking and alarm trains. The going train has a vertical verge escapement and balance situated on the top plate. The count-wheel striking indicates the hours on the bell. 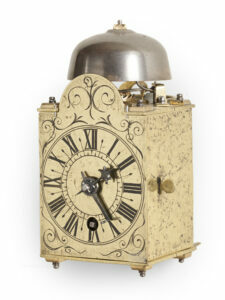 In addition, the clock has alarm with a separate shaped two-sided hammer. 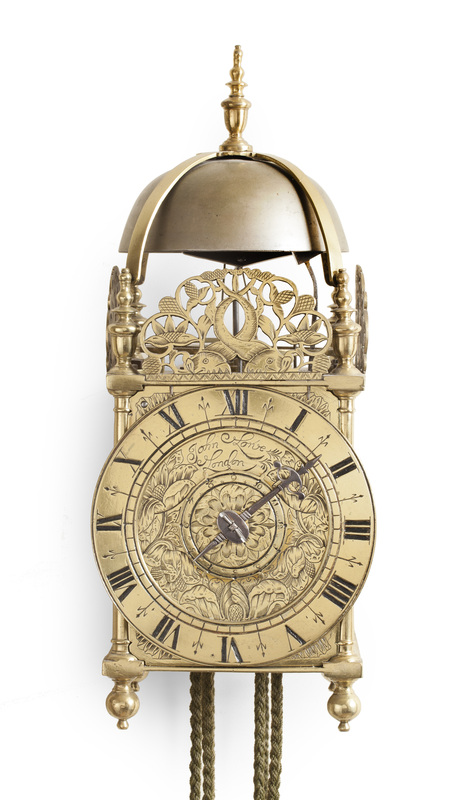 The brass dial has a Roman chapter ring with half-hour and quarter-hour divisions and is engraved with floral and leaf motifs. 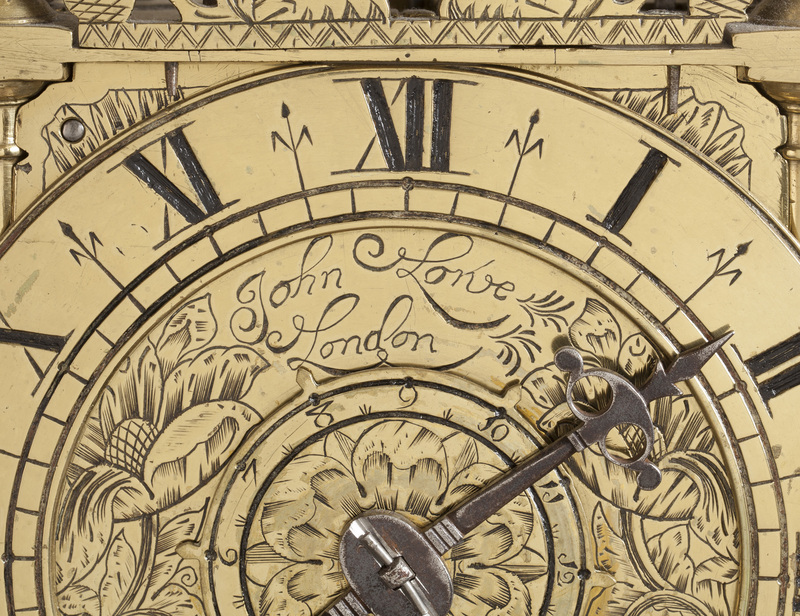 Behind the steel hour hand is a large Arabic alarm disc engraved with a Tudor rose, the alarm time being indicated by the tail of the hour hand. 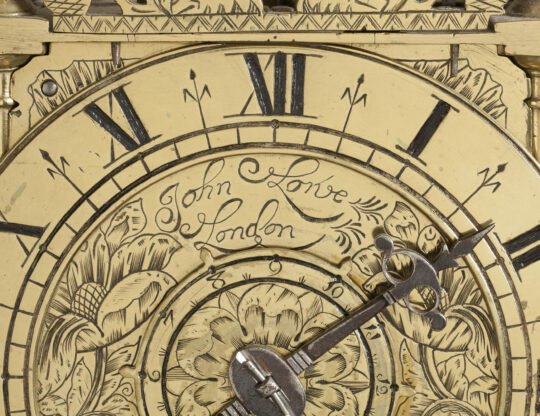 The maker has signed the clock above the middle John Lowe London. 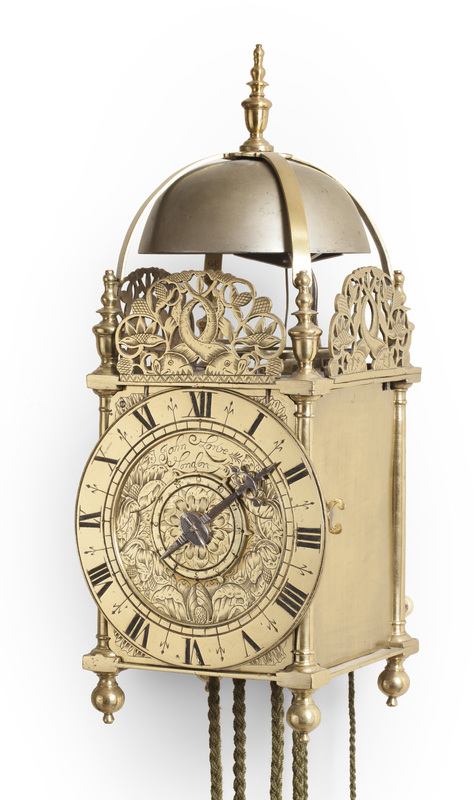 The brass case has a classical lantern clock shape with a prominent dial, two brass doors to the sides, an iron backplate with an external alarm and two spikes. 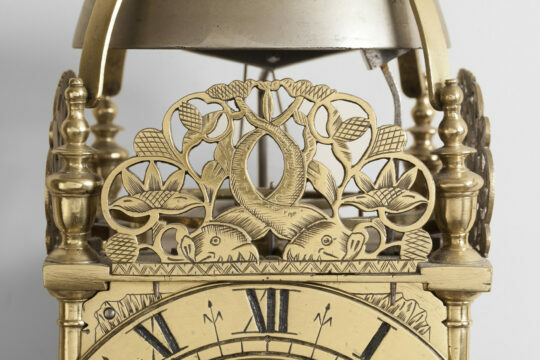 The hoop is attached to the top plate, the whole being surmounted by a bell in a bell strap surrounded by pierced frets. 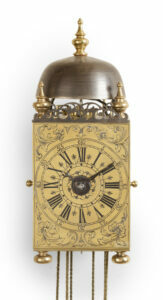 There are four brass pillars on the corners with turned finials at the top and drop finials at the bottom. The bell is surmounted by a similar finial. The front fret is engraved depicting two dolphins with intertwined tails. B. Loomes, Watchmakers of the World, London, 2006, p. 494. John Lowe (1638-1728?) was apprenticed to the famous lantern-clock maker Nicholas Coxeter, later to Francis Munden. He had a long working life and had several apprentices through the years. In 1695 he is recorded in the Parish of St Mildred Poultry, together with his wife Mary and children. 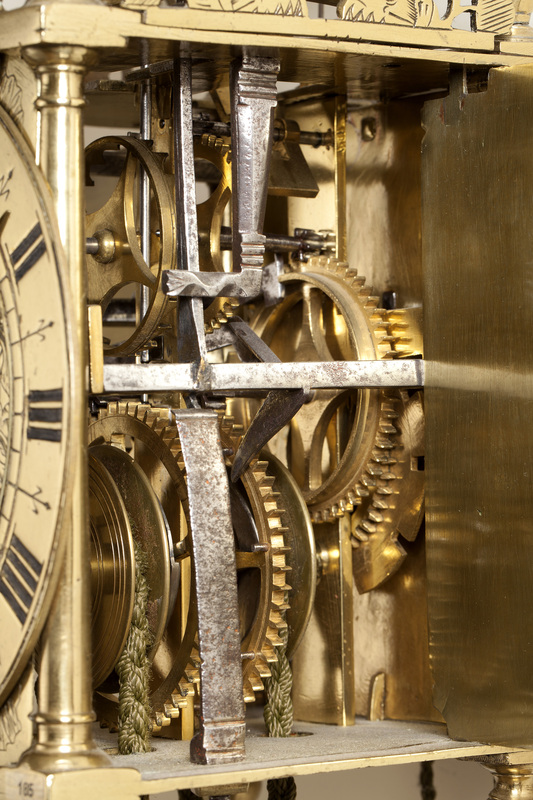 Apart from lantern clocks, watches and longcase clocks are also known by his hand.